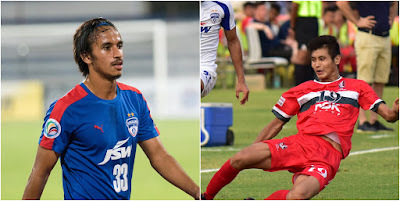 Bengaluru FC have completed the signing of youngsters Sairuat Kima and Gursimrat Singh Gill on two-year deals till the end of the 2019-2020 season, the club announced on Monday. The duo join Kean Lewis and Rino Anto in the Blues’ camp as they continue to reinforce their squad ahead of the AFC Cup Inter-Zone Semifinal tie against Turkmenistan’s Altyn Asyr FK in August. Twenty-one-year-old Gursimrat, who first joined Bengaluru in 2016-17 season from the AIFF Elite Academy, went on to feature in the I-League and the AFC Cup campaigns before being part of the Federation Cup winning squad in May 2017. The youngster was excited to rejoin the Blues after spending a season with NorthEast United. “I'm really happy to have joined Bengaluru FC again. I was unlucky to be injured for most parts of my first stint at the club, but I'm glad that the club kept an eye on me and wanted to bring me back. I'm looking forward to joining the team and playing a part again,” said Gursimrat who made five appearances for the Highlanders in the ISL. Meanwhile, 20-year-old Sairuat who joins the club from Jamshedpur FC, began his youth career with Mizoram-based Chanmari FC before joining the DSK Shivajians youth setup in Pune. He was promoted to the first team during the 2016-17 season where the 6’3” tall defender featured in the Durand Cup and the Federation Cup apart from being a mainstay in defense in the I-League. The U23 India International was then snapped up by Jamshedpur in the ISL 2017-18 draft and featured for the Jharkhand-based side in the Super Cup. “This is a big moment for me, and I’m really grateful for this opportunity. I’m excited to play for a professional club like Bengaluru FC, one that I’ve admired a lot. To go onto the next level, I must train regularly with the best players and BFC have the finest of the lot. Playing with them is something I’m eagerly looking forward to and hopefully I’ll give my everything and achieve success with the club in the coming years,” said Sairuat after completing formalities.